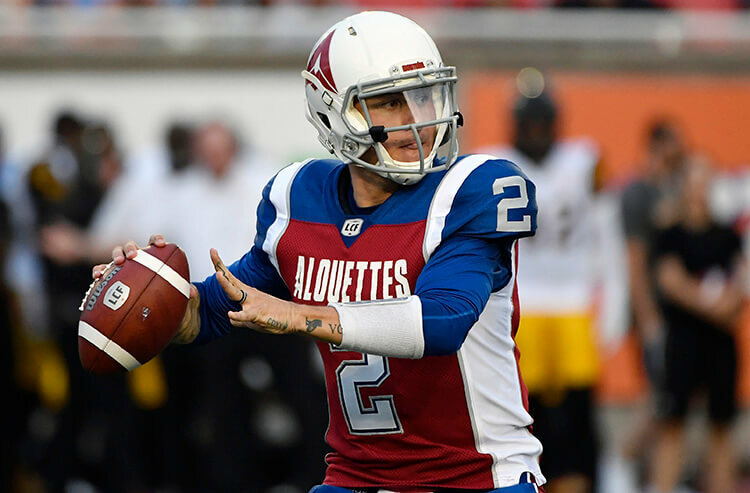 Will Johnny Manziel make his AAF debut with the Memphis Express this weekend? He's not starting but is available off the bench. 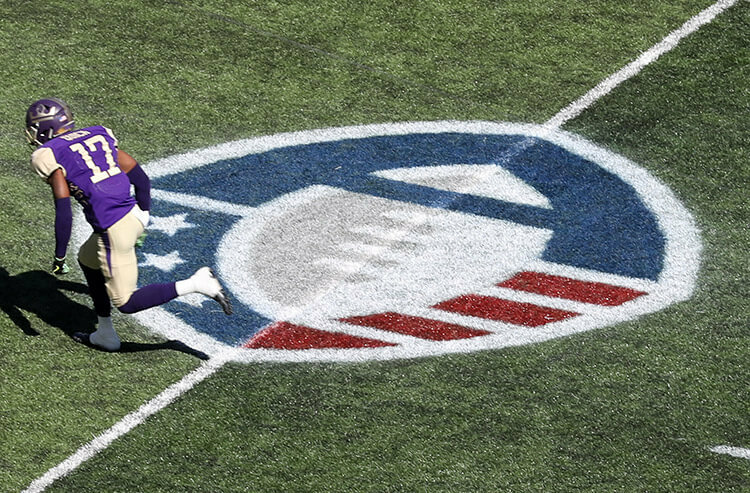 We are officially into the home stretch in the inaugural season of the Alliance of American Football (AAF) with just four games remaining. 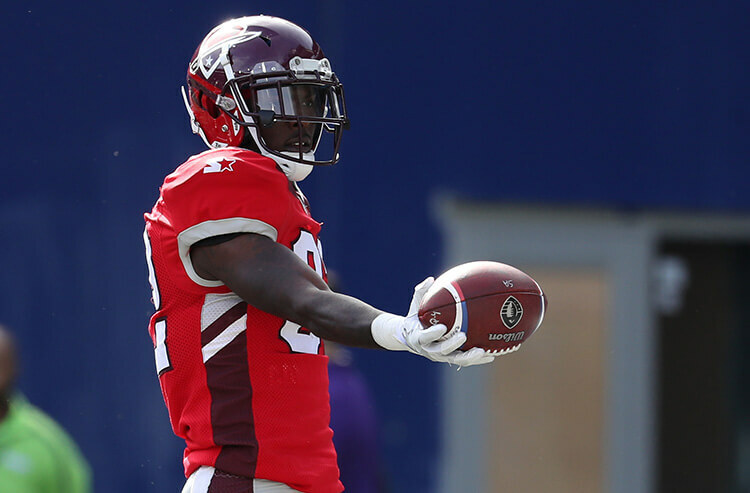 This big question this week is whether Johnny Manziel makes his AAF debut with the Memphis Express this weekend. There are also some big games on tap, including one with playoff implications in the West. Not a great week as my two-week best bet winning streak came to an end as the Atlanta Legends fell flat on their faces in getting smoked by a San Antonio squad that was playing its fourth consecutive road game. My leans went 2-2, hitting on the Under in the Arizona-Orlando game (the Apollos are now 0-4 to the Under at home) and the Over in the San Antonio-Atlanta game (the Legends are now 3-0 to the Over at home), while missing on Memphis +8 (it lost by 13) and San Diego -6 (it lost outright at home on a walk-off field goal). The Over/Under went 2-2 last week and is now 10-14 on the season. The road team went 3-1 against the spread for the third straight week. Underdogs won outright in three of the four games last week. Home teams are now 11-13 ATS on the season and 13-11 straight up. Favorites are now 16-8 straight up and 12-12 ATS on the season. Orlando: 4-2 ATS, 2-4 O/U. On the road: 3-0 ATS, 2-1 O/U. Atlanta: 2-4 ATS, 3-3 O/U. At home: 1-2 ATS, 3-0 O/U. Previous meeting: Orlando 40 Atlanta 6 (Week 2 in Orlando). I’ve been hinting at an Orlando letdown for a few weeks now and it finally happened last week as it was upset at home by Arizona. 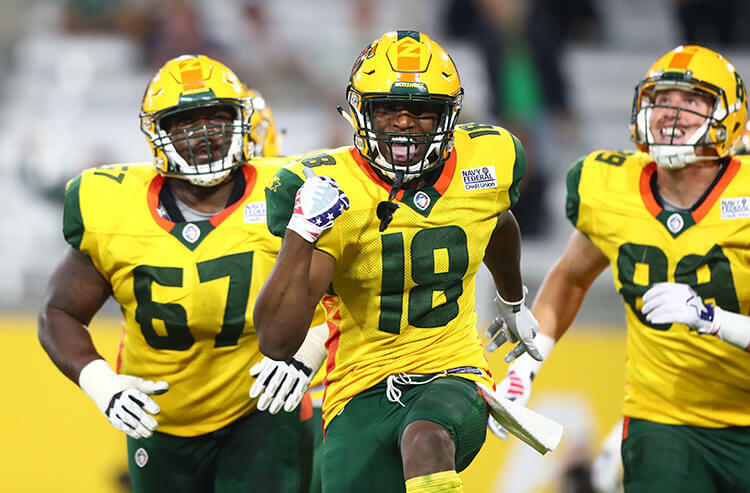 The Apollos almost stayed undefeated but their comeback attempt was cut short when they committed a false start while attempting to spike the ball on the Hotshots’ seven-yard line with four seconds remaining, which resulted in a penalty that ended the game. Atlanta was in a perfect situation for a big home win last week but put in an absolutely awful performance in getting trounced 37-6. Aaron Murray, who had been playing decently well as the starter, imploded for three interceptions while throwing for just 5.2 yards per attempt. He was eventually pulled for Peter Pujals but should be back under center on Saturday. Lean: Over 42. Orlando has shown an ability to score on the road, while the Legends do pretty much all of their scoring at home. I like Murray to bounce back and for the Apollos to run up the score a bit coming off their first loss. They should be able to do so quite easily against an Atlanta defense has allowed 20 or more points in all but one game so far this season. Salt Lake: 4-2 ATS, 2-4 O/U. On the road: 2-1 ATS, 2-1 O/U. San Antonio: 4-2 ATS, 3-3 O/U. At home: 1-1 ATS, 1-1 O/U. You may as well throw out any San Antonio home trends seeing as it hasn’t played a game in the Alamodome since Week 2. The Commanders return home on a roll with three straight wins and should get a boost from a fired-up crowd of around 30,000 (San Antonio had crowds of 27,857 and 29,176 in its first two home games). San Antonio seems to have found an offensive rhythm with 29 and 37 points for in its last two. The defense, however, continues to be inconsistent. Here are its points against for each week, starting in Week 1: 6, 37, 31, 11, 25, 6. Salt Lake doesn't have a win yet away from home. That's the bad news. The good news is that the Stallions seem to have developed a bit of offensive consistency and have scored between 22-25 points in four of their six games so far this season. Lean: Over 40.5. Here's hoping that the bad version of the Commanders defense shows up and that San Antonio puts up enough points on offense so that Salt Lake doesn't have to do too much. San Diego: 2-4 ATS, 3-3 O/U. On the road: 0-2 ATS, 1-1 O/U. Arizona: 2-4 ATS, 2-4 O/U. At home: 1-2 ATS, 2-1 O/U. This is probably the most important game of the AAF season to date as the Hotshots and Fleet are currently tied for the second and final playoff spot in the West. In fact, the winner could find itself tied for first if San Antonio loses at home to Salt Lake. There's no doubt that the Fleet have been a different team at home and on the road. Their two road games resulted in a 15-6 loss at San Antonio in Week 1 and a 26-23 loss at Memphis in Week 3 — though it should be noted that was the game where starting QB Philip Nelson got hurt in the second quarter and then third-stringer Alex Ross fumbled away a huge lead in the second half. If someone can figure out this Arizona team, I'm all ears (on Twitter). The Hotshots have looked like one of the league's best in Weeks 1, 2, and 6 and one of the league's worst in Weeks 3, 4, and 5. They also seem to play better on the road, perhaps because they average under 10,000 fans a game in Tempe. Lean: San Diego +3.5. If Arizona loses last week at Orlando — and the Hotshots almost blew the game — this line is probably San Diego -1.5. The Hotshots are 0-2 in their last two home games and looked really bad in three of those four halves. Birmingham: 3-3 ATS, 3-3 O/U. On the road: 2-0 ATS, 2-0 O/U. Memphis: 3-3 ATS, 2-4 O/U. At home: 2-0 ATS, 1-1 O/U. The Iron play their second consecutive road game after playing just their second road game of the season in last Sunday's win in San Diego. Their quarterback situation is unclear — Keith Price got the start last week but left with an undisclosed injury. Luis Perez, the team's starter in Weeks 1-5, came on in relief and played his best game of the season: 27 of 49, 359 yards, 3 TD, 2 INT. Coach Tim Lewis hasn't named a starter yet for Week 7. Memphis' quarterback situation is more clear: Brandon Silvers gets the start and Johnny Manziel is available off the bench. Silvers was average at best in Week 6 in relief of the injured Zach Mettenberger: 23 of 37, 242 yards, TD, fumble. The Express are bad and won't make the playoffs, making it only a matter of time until they play Manziel to help boost attendance and ratings. Lean: Birmingham -3. It shouldn't matter who is at QB for the Iron as their defense should be able to hold the Express to minimal points. Memphis' offensive line has allowed 10 sacks over its last two games, including a whopping seven last week against Salt Lake. The Iron should win this one easily. Looking to bounce back and even my best bet record at 3-3 with the San Antonio Commanders -5. This team should get a huge lift from being back home after an unprecedented four-game road trip during which it went 3-1. The Commanders should also be motivated to keep their one-game lead atop the West Division. Salt Lake has had its moments so far this season but most of those moments have come at home as the Stallions are 0-3 on the road. I think the Commanders should be favored by seven or eight so I'll gladly take the current line at -5.